is an authoring tool for developing video games in a drag-and-drop fashion, utilizing visual editors and a behavior-based logic system. is used by creative professionals such as graphic designers, animators, and game developers for rapidly prototyping, building and self-publishing cross-platform games and other interactive media. See Product Description below for more detail. With GameSalad Creator Pro you can get additional benefits like Android publishing, in-app purchasing, Apple Game Center, and additional money-generating opportunities! 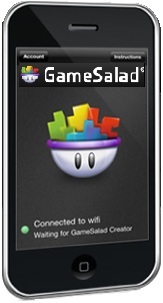 Android Publishing: GameSalad Creator Pro developers have access to export their games for Android publishing. This option includes support for most major Android marketplaces, along with the most popular Android devices, including Amazon Kindle Fire, B&N Nook Color, and the Samsung Galaxy Tab. iOS In-App Purchase: GameSalad Creator Pro developers can engage in the free-to-play model that is taking mobile gaming by storm. No more need for Premium and Lite versions harness the power of unlockable content! Apple GameCenter: Take advantage of Apple’s global leaderboard and achievement system with the Game Center Pro behaviors within GameSalad. It is easy to engage your players on a higher level by rewarding them for continued play, outstanding resourcefulness and skill, or just plain awesome luck giving them even more reasons to play your game again and again. Priority Tech Support: As a Professional GameSalad Developer, you also receive priority technical support. Priority technical support requests will receive an initial response from GameSalad within 24 hours on business days, and additional assistance troubleshooting projects. App Monetization: Through GameSalad’s partnerships, Professional developers have access to innovative methods of monetizing their apps which allows them to capitalize on the wave of Free-to-Play game popularity. GameSalad partner PlayHaven provides developers with a fast “check-box” way to introduce lucrative ads in your game, with no intrusion to gameplay. iAd Revenue: Free apps get more downloads than paid ones. But that doesn’t mean all that work gets you nothing. With GameSalad “Show iAd” pro behavior, you can integrate an entire revenue channel into your game in seconds. External Links: Using the Open URL pro behavior, draw players to your other titles for increased sales, entice them to leave a review on the App Store, or direct them to nearly any destination on the web. Just apply the behavior to an actor and enter in your link. Windows 8 Publishing: Windows 8 includes new features that will allows end users to have a cool icon of their favorite applications on the Modern UI desktop. Edit your profile, as well as stay on top of the latest GameSalad and iOS developments, without having to switch programs or browsers using GameSalad community news through the new dashboard. Drag & Drop your own art and sound into your game right from your desktop. Create complex actions from a long list of basic and established game behaviors. Test your games directly on a device. Store recently tested games on your device and show them off anywhere. Windows Vista, Windows 7, or Windows 8. Android SDK for Android support.Core 2 Duo or Later CPU required. Minimum of 2GB of RAM recommended.